What Are Wordless Children’s Books and Where Can I Find Them? Wordless children’s books rely on illustrations to tell the story and allow children to create their own narrative in their head. These books may have no words at all or may have just a few words on each page. Wordless books are commonly found in school and public libraries and can cater to children of all ages in elementary school. Popular examples include The Lion and the Mouse by Jerry Pinkney, Goodnight Gorilla by Peggy Rathmann, and Journey by Aaron Becker. Why are Wordless Books Important? It familiarizes children with books. When just starting out on their journey with reading, children need to learn the basics of books: which way to read the book (front to back), what the spine and title page are, where to find the author’s name, etc. Wordless books provide the perfect opportunity to introduce these important aspects of reading to a young child. They allow children to use their imagination. Children can use context clues to infer what will happen next in the story. They are able to make up whole conversations and narratives based on a single page of illustration. The complexity or simplicity of the story is up to them and can easily be guided by additional questions from an adult. The story changes depending on who is reading it. This maintains a child’s interest in reading by never allowing the story to get repetitive. This dynamic aspect of wordless books has the potential to get children excited about all of the various book options available so they can get more creative with their stories! You can read them in any language. Illustrations have no language. This means that reading as a family doesn’t need to be limited by what language is read in the home or what reading level the parents are at. Children create the story, and can do so in the language they feel most comfortable and excited about. To help drive home the importance and dynamic use of wordless children’s books, we read these in our Family Literacy Program -- which is starting back up soon! This program, which only runs in the spring, focuses on making reading a fun habit for the whole family. Our volunteers and staff work with families to deliver ten hours of parent education over the course of seven weeks. Each workshop includes an information session and skill-building exercises for parents, group story time, and guided activities for parents and children. We continue to do this each year because we have seen promising results and feedback from the session, including a 29% increase in the positive literacy behaviors in the home environment following the workshops. If you would like to learn more about our Family Literacy Program or how to get involved, click here. What happened in our Family Literacy Program in the 2017-2018 school year? Well…a lot! To start, 437 families came through the door, taking home 2,511 books and clocking 1,310 hours of shared learning time. Let’s dive in and share what else happened in the program this year! An image of Sheena Burks. She is standing in front of a bare wall and smiling at the camera. In our sixth year of the program, our expanded facilitator team included Sheena, a talented mother and preschool teacher who attended the program the past two years with her young boys. She is the first parent participant to go on to lead the program with other families. Sheena has been able to use her experience as a participant in the program to shape her leadership style. Over the past year, Sheena has inspired 72 families through the Family Literacy Program, while sharing her own stories and experiences to help strengthen their connection to reading. Through this unique perspective, Sheena has been able to see the incredible effects the program has on children and families. An image of Sheena facilitating a Family Literacy session. She is sitting on the floor with guardians and children while they all look at books together. • 68% more families reported having a routine for looking at books with their child. • Families reported an average 38% increase in the size of their home libraries, growing on average from 11 to 16 books. 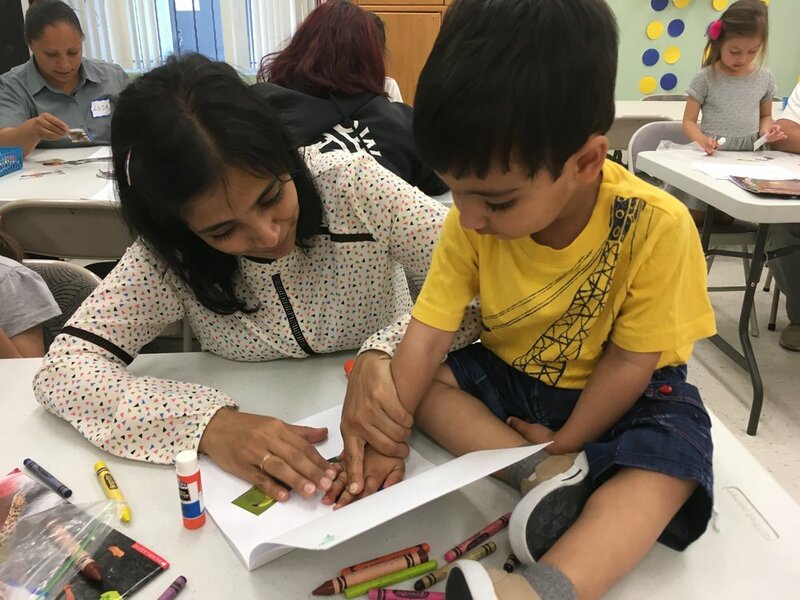 • Families that completed our program reported a 40% increase in understanding how their preschool child learns and have created a language-rich environment for them. Parents play the most critical role in developing skills and abilities within their children. Parent engagement is one of the key factors in a quality childhood program. At Words Alive, we know that our Family Literacy Program is engaging parents in a meaningful way and making an impact on the families who participate each year. We have successfully collaborated with a variety of partners like the Fullerton School District, who offered four sessions of our program in their schools after we trained their staff and provided curriculum. We continue to see the same results in the families through this training model and through direct services. 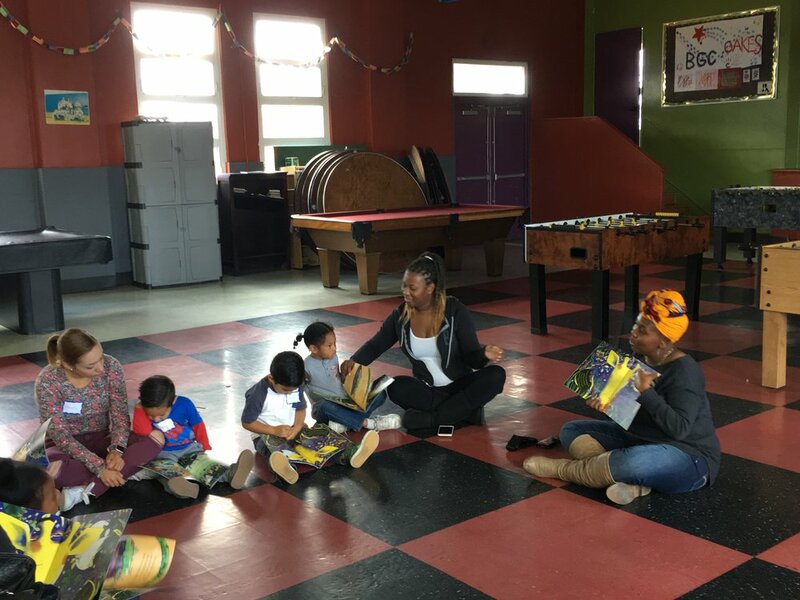 Going forward we want to continue to diversify where we can offer our Family Literacy Program by reaching out to families through classes located within their communities. Learn more about our Family Literacy Program here! Family Literacy is a type of literacy education that emphasizes bringing reading and writing into the home and making it a family activity. 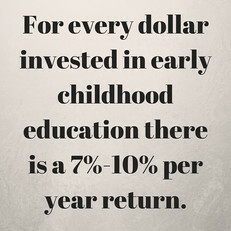 According to a study conducted by the National Center for Education Statistics, children with a “richer home literacy environment displayed higher levels of reading knowledge and skills than did their counterparts with less rich home literacy environments.” Family literacy is imperative in creating a foundation for children’s learning experiences, and it all starts with the parents. Illiteracy in today’s children can be traced back to their parent's literacy experiences in their early lives. When parents do not feel comfortable around books, they don’t read to their children and they likely don’t have many books in the house for their children to look at or read themselves. This is why family literacy programs emphasize teaching families together and ensuring that the parents understand the importance of reading outside of a school environment. It’s not just about reading though -- in the same study by the NCES, singing songs and telling stories to children can also lead to early reading success. 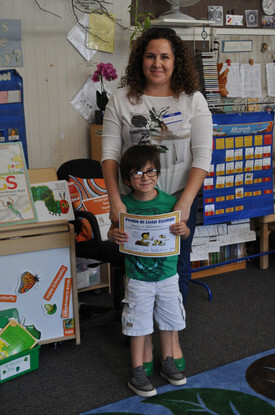 A picture of a parent and child working together on an exercise in our Family Literacy Program. The child is sitting on top of the table while working, showing how we emphasize play and comfort in literacy education! As mentioned by the Urban Child Institute, a child’s brain develops at a rapid rate during their early life. By age 3, the brain has reached 80% of its adult size. Developmental experiences in these years determine the organizational and functional status of the mature brain. This is an important time in a child’s life to talk to them, look at pictures, and read books with them so they get as much exposure as they can before they begin formalized school. Parents teach their child how to navigate the world, and when parents take time to do these things, they are teaching them healthy reading habits for life. In the earliest stages of a child’s life, the parents don’t need high literacy to teach their kids a love of books. Just asking the child to use their imagination and create a storyline for the book themselves, teaching them various sounds, and asking them questions can help develop important habits surrounding literacy. When the families make this a routine and enjoy these activities together, the building blocks of early reading success are being set up. Another example of teaching with play! Two students learn terms like "through" by crawling through a tunnel at one of our Family Literacy sites. Read more than books together -- read road signs, nutritional labels, etc. Let your child pick out the books you read together. Ask your child questions about the books or pictures. Relate the book to your child’s life. Sing songs and rhymes together with your child. The Family Literacy program that Words Alive runs has demonstrated an 87% increase in the percentage of families who look at books together at home by the end of the 7 week program. This incorporation of books into the home is important when looking at future reading and literacy success. If you are curious to learn more about our Family Literacy Program and what it has to offer, the program is running right now! Head to our main website to find out more about volunteering with us or joining our Family Literacy workshops.